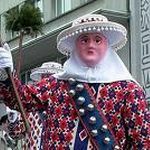 The start of the carnival season in Switzerland begins in the traditionally Catholic regions. The most famous of these is in the city of Lucerne. It begins on "Dirty Thursday" and continues until Ash Wednesday, the start of Lent. 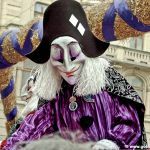 As a Protestant Canton, Basel's carnival known as Fasnacht breaks with this tradition by beginning on the Monday following Ash Wednesday which this year was March 6. Basel Fasnacht begins with Morgestraich. By 3.30 on Monday morning the hundreds of Cliques made up of Fife players and drummers assemble with their lanterns in various parts of the old city. At precisely 04.00 hrs all the lights in are turned off and the Cliques begin marching all at the same time. There is no official marching route, cliques weave in and out of the small alleys and streets and continue well into the day. Fasnacht lasts for exactly 72 hours and thereby ends on Thursday morning at 4am. The official body for organizing Fasnacht in Basel every year is the Fasnachts-Comite. Their website explains everything you ever wanted to know about Basel Fasnacht. The Nüssler dances in Schwyz and neighbouring Brunnen, Steinen and Sattel are a unique tradition in the Swiss carnival world. The Nüssler are men and boys in traditional costumes, wearing masks based on characters from the Venetian Commedia dell' Arte. They dance in small steps to the sound of drumming. Originally they handed out nuts (Nüsse), which is what gives the custom its name. The Lötschental in Canton Valais is famous for the Tschäggätta tradition, which takes place in February. Young unmarried men and boys roam the streets of the villages of the valley, wearing demonic masks and tunics made of sheep or goat skins, and ringing bells. The name refers to the black and white colour of these tunics: "tschäggätta" means "piebald" in the local dialect. By tradition the Tschäggätta wear gloves smeared with soot, and take the occasional swipe at anyone they meet (particularly young women). The masks are handcarved, and each one is different. They normally feature crooked teeth and bulging, uneven eyes. It is said that they reflect the untamed nature of the valley. They have also been interpreted as an expression of anarchy and rebellion in a peasant society that was largely dominated by the church. The tradition stems from the time the valley was cut off from the outside world in winter. 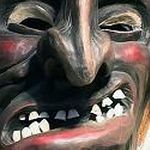 Unlike other mask-related customs in Switzerland, the Tschäggätta were never formally organised in any way. Processions have only been held on specific dates since the late 1960s, when custom looked in danger of dying out as young men left the valley in search of work. Scheibenschlagen is an old custom of courtship that takes place on the first Sunday of Lent. 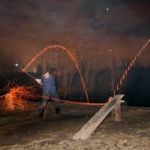 Using long poles, young unmarried men hurl burning wooden discs down the valley while shouting out the names of the girls they like.